Production has kicked off on the second season of RTÉ drama Striking Out, which means we're one step closer to the acclaimed show returning to our screens. Shooting on the second season began today and will run for twelve weeks. The first series of the drama aired on RTÉ One in January 2017, and followed the tumultuous professional and personal life of Dublin-based solicitor Tara Rafferty, played by Amy Huberman in her IFTA-award-winning leading role. The first series began with a bang when Tara discovered her fiancé and fellow solicitor Eric was cheating on her with a colleague, leading to her breaking up with him, quitting her job at the prestigious law firm they worked at together, and launching her own legal firm. The second series will see Tara striking back. She's now her own boss and will have to navigate some morally challenging scenarios along with her team. 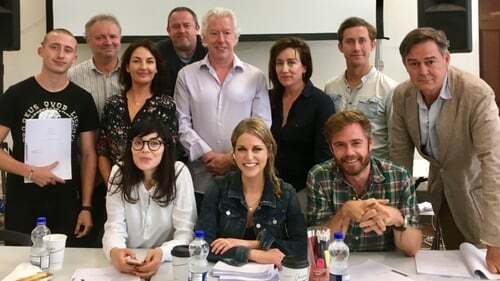 A host of new actors join the cast for the second series, including Moe Dunford (Vikings), Maria Doyle Kennedy (Redwater), Charlotte Bradley (Veronica Guerin), Owen McDonnell (My Mother and Other Strangers), Adam Fergus (Clean Break) and Jane Brennan (Paula). The new series will also welcome back some fan favourites including Neil Morrissey, who plays Tara's mentor and friend Vincent, Rory Keenan, who plays her former fiancé Eric, Emmet Byrne who portrays her street smart and opinionated client-turned-assistant Ray, and Fiona O'Shaughnessy who plays private detective Meg Riley. Season two of Striking Out will run for six episodes. It has not yet been announced when it will return to screens.